HSINCHU, TAIWAN--(Marketwired - Apr 20, 2017) - The Industrial Technology Research Institute (ITRI), Taiwan's largest applied research institution, was honored at the 2017 Edison Awards in New York with its URABat technology. URABat, an ultrafast rechargeable aluminum battery, won Silver in the Energy & Sustainability/Power Source category. 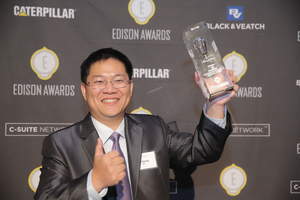 The Edison Awards have been recognizing the best innovations and innovators in the spirit of Thomas Edison since 1987. Other winners this year include Dow Chemicals, GE Global Operations, and 3M. URABat, co-developed by ITRI and Stanford University, has achieved three breakthroughs: (1) discovery of the perfect combination of aluminum and graphite as the battery cell; (2) the whole battery cell is as supple as paper, and can be mass produced for various demands and product attributes; (3) the stability and durability which make the battery safe even if damaged by an external force. Currently URABat can reach a charging rate of 100 C (recharged in less than one minute) while maintaining a specific energy of 90 mAh/g and a charging/discharging efficiency greater than 99%. ITRI has certified a full-scale battery and concluded pilot production of a large surface coating for battery manufacturing. One 48 V/1Ah aluminum battery installed in an electric bicycle for road tests demonstrates a full charge within 6 minutes, a charging rate 20 times faster than conventional lead-acid batteries. "There hasn't really been a substantial growth in battery technology as the one that ITRI has provided us," commented Frank Bonafilia, Executive Director of Edison Awards. "We are so pleasured to have ITRI here at the 2017 Edison Awards. It's a company that does everything we want to be associated with, a company we want to honor. They're pursuing that innovation is not just fun but also important," said Steve Herring, Senior Director of Nomination from Edison Awards. "We are glad that URABat has once again been recognized by an international accolade after winning the 2016 R&D 100 Awards," said Dr. Chang-Chung Yang, Deputy Division Director of ITRI's Green Energy and Environment Research Laboratories. "URABat is expected to offer a new power storage alternative that would hugely impact the world. The Edison Awards honor just reaffirmed our commitment to accelerating its commercialization process." According to Dr. Yang, the technologies including the graphite materials for cathode, ionic liquid, battery cell structure, modules, and fast-charging control should put the team in a leading position among the research community of this area, and a solid foundation has been laid for future commercialization of aluminum battery technology. After commercialization, it will compete with lead acid batteries in electric motorcycles, scooters, bicycles, and in renewable energy storage in electric grids and with lithium batteries for mobile devices in the future. A video of URABat demo is available here: https://www.youtube.com/watch?v=BfDAPkIW18M. Industrial Technology Research Institute (ITRI) is one of the world's leading technology R&D institutions aiming to innovate a better future for society. Founded in 1973, ITRI has played a vital role in transforming Taiwan's industries from labor-intensive into innovation-driven. It focuses on the fields of Smart Living, Quality Health, and Sustainable Environment. Over the years, ITRI has cultivated more than 140 CEOs and incubated over 240 innovative companies, including well-known names such as UMC and TSMC. In addition to its headquarters in Taiwan, ITRI has branch offices in the U.S., Europe, and Japan in an effort to extend its R&D scope and promote opportunities for international cooperation around the world. For more information, please visit http://www.itri.org/eng. Dr. Chang-Chung Yang, Deputy Division Director of ITRI's Green Energy and Environment Research Laboratories, receives Silver for URABat technology at 2017 Edison Awards.